In collaboration with Amazon, LINE FRIENDS is participating in the (SHOPATHON)RED campaign for the first time. The company has launched two limited-edition (LINE FRIENDS)RED products – “Piggy BROWN” and “Heart BROWN”. 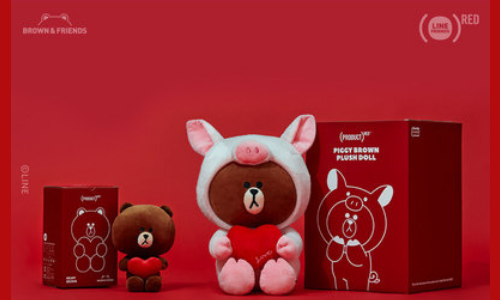 “Piggy BROWN” and “Heart BROWN” (LINE FRIENDS)RED products featured the brand’s iconic character BROWN holding a red heart. The (RED)-branded package was curated to deliver the purposes and messages of the campaign. These new products are showcased with new packaging on Amazon.com/RED. The company will support nonprofit organisation (RED) to fight against AIDS by contributing 15% of the purchase price from every (LINE FRIENDS)RED product purchased to the Global Fund, which uses the contributions to fight against AIDS, tuberculosis and malaria, as well as support HIV/AIDS funding in Sub-Saharan Africa from 19 November to 31 December. Some other global brands, including Apple, the Coca-Cola Company and Starbucks also joined the campaign. LINE FRIENDS is rising as a global character brand after expanding its distribution channel on Amazon Global. In addition to the (SHOPATHON)RED campaign, the company has engaged in various philanthropic activities, such as a partnership with UNICEF to aid children around the world. As competition around the region heats up, STB looks to create a bold new marketing strategy. More here. ..
A bank leveraging a blockbuster movie to drive online transactions might appear to be somewhat tenuous but UOB thought otherwise. ..